“Rise and shine! It’s going to be a beautiful day.” The clock read 4 a.m. as I struggled to read the text message from my dad. While he was no stranger to grossly early wake-up calls, I’d spent the last 33 years happily sleeping in. But if dragging myself out of bed before sunrise meant taking part in the first group hike my family had done together in over a decade, I figured I could make the sacrifice. We arrived at the Mitchell Lake trailhead just as the first streaks of light washed over the Indian Peaks Wilderness area. Our footsteps crunched through the early morning silence, over foot bridges covered in thin layers of frost and through towering walls of sweet smelling pine trees. 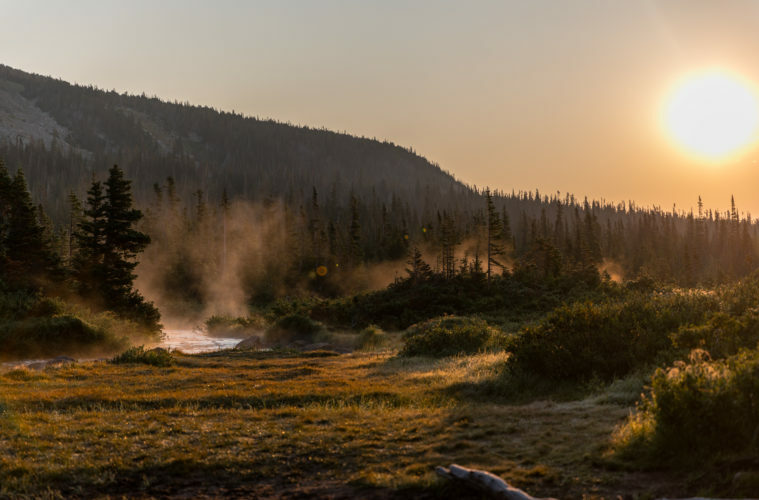 A break in the trees revealed a picturesque Mitchell Lake where fish dined on breakfast and rays of sunlight cut through curtains of steam rising from the water. The beautiful scene was captivating, so I followed my sister and parents along a short path to the edge of the water where we stood in silence, drinking it all in. A rustle back on the trail interrupted the quiet moment, and we turned to watch a mama moose and her baby stroll by. I smiled in solidarity, knowing that my family wasn’t the only family heeding the early morning wake-up call from the mountains.